your teens will see the hypocrisy. bring them up -> training & nurture them. Understand where they are. Ask questions. Meet kids where they are at. I need to find a way to connect with my kids. Take responsibility for what I do? God -> to teach us faith, unconditional love. Jesus was adopted by Joseph. God ordained every day, including us adopting. Biological or adopted – they are ours, just the same. God sent his son so that we might be adopted. Learn not to give in fear & anxiety. your adoptive children to sacrifice. Mordecai was just the right teacher for Esther. “Now is our time to change the world.” – Do I believe that? Is that my goal? 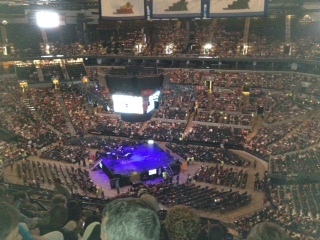 Kick off of the marrieds conference – about 18,000 disciples in San Antonio, TX. We have made Jesus Lord of our individual life, but we need to make Jesus Lord of our family & marriage. This needs to be about heart – not just about action – we need to connect heart-to-heart. Greatest thing to want is for our kids to have a relationship with God. Not about academics, sports, etc. Talking about God’s word all the time – days, conflicts, events, etc. – relate to God & the scriptures. Take a step back & listen to how our family talks to each other (parents as well). Do the rituals & traditions of our family glorify God? Does our family rejoice & celebrate God? Don’t label our kids – realize that our kids are testing us to see how much we love them. Each child needs to develop their own faith. I have to keep growing in my faith – I need to set the example. I always have to look this up. This is the way that I like to just edit the file for ignoring files with subversion. I accidentally did a passthru of my boot device to a vm. This is a real gotcha because then the Host cannot modify the config. Disclaimer – this could completely hose your system, proceed ONLY if you know what you are doing (or have nothing to lose). However there are a couple of additional notes that I need to add because things were a little different. - from: /device/000:000:26.0/owner = "passthru"
- to:   /device/000:000:26.0/owner = "vmkernel"
After that I shutdown the VM & rebooted. The system came back up, I had a little clean up & documentation to do, but it was recovered. I had the problem with my login display on RHEL 6 being wrong. I could not see any of the additional buttons on screen (ie I couldn’t shut down the VM without logging in). (my addition) lock gdm’s account in shadow by replacing password hash with ! !